This year's event featured some of the best junior players from across Canada and around the world, including the US, Korea, Japan, France, South Africa and Hong Kong. In the boy's final, Graeme Kassautzki of Vancouver defeated Vasek Pospisil of Vernon, BC, 6-0, 6-3. Graeme, second photo, is one of the best junior players in Canada. He was the winner of the 2003 event and the runner-up in last year's final. 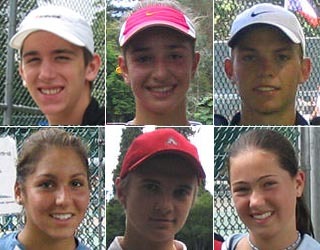 Graeme has played in the past for Canada's Junior Davis Cup team. Guillanume St Maurice, third photo, tournament top seed, lost in the semis to Vasek Pospisil, 7-6, 6-2. In the girl's final it was Stefi Gjine over Alexandra Odell-Michels (3), 6-3, 6-1. Stefi, a tennis sensation from North Vancouver, earlier had to beat the number one seed in the quarter finals and the number five seed in the semis. In the boy's doubles final, Graeme Kassautzki and Vasek Pospisil defeated Matt D. Manasse and Philip Nemec. In girls' doubles action, Stefi Gjine teamed up with Alexandra Odell-Michels to defeat Marie-Pier Huet and Casey Kennedy, in a close match 3-6, 6-3, 6-3.